Broadway In Chicago announced that The PrivateBank Theatre at 18 W. Monroe will have a new name and Marquee as the CIBC Theatre. This represents The PrivateBank name change to CIBC under a unified brand globally following their June acquisition. 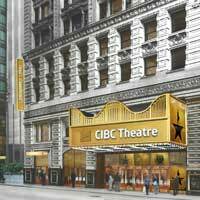 Lou Raizin, President of Broadway In Chicago said, â€œWe are happy that CIBC will continue to support Broadway In Chicago's mission to attract the best shows like HAMILTON. Their sponsorship of the CIBC Theatre represents a commitment to Chicago and its vibrant theatre community." â€œWe are proud to show our commitment to a strong and vibrant Chicago with our continued sponsorship of Broadway In Chicago and the CIBC Theatre. We also are excited that, through this partnership, we are able to continue to provide arts education opportunities for students throughout Chicagoland," said Larry D. Richman, Senior Executive Vice-President and Group Head, CIBC U.S. Region and President and CEO, CIBC Bank USA.